Carpet Cleaning Vs New Carpet | Can My Carpet Be Cleaned? When Does it Make Sense to Clean Your Carpet or to Replace It? Have you reached the point where your carpets look so worn and discolored you are considering replacing them? Whether you own a home or a business, there comes a point when foot traffic wears down the carpet. This leaves you with a less than beautiful interior. Deciding between replacement and cleaning can be a hard call. The decision ultimately comes down to a few determining factors as well as your personal preference. Here are a few factors to help decide if your carpet can be cleaned, or if it’s is time to replace your aged carpeting. Is The Carpet Dirty or Worn Out? Carpets experience physical wear over time. Dry soil acts as an abrasive that slowly tears carpet apart. This wear typically occurs more quickly on commercial carpets with lots of traffic. However, it happens in your home too. Frequent maintenance of your own carpet through vacuuming helps. Still, a vacuum does not reach all the way to the base of carpet fibers where the damage can occur. Scheduling periodic carpet cleaning will help any carpet last longer and look better. It will also help avoid early replacement. It can be hard to determine if your carpet is dirty or if it is actually worn down. Many times, customers mistake darkened areas as dirty. Really, it may be burst carpet fibers reflecting the light differently. Sometimes, however, the wear is obvious. If you have damaged the fibers to the point there are bare spots showing, carpet cleaning won’t fix that. That spot in front of where the same recliner has sat for 15 years, for example? Replacement is probably going to be necessary to achieve a uniform appearance. If, however, the heavy traffic areas are simply discolored due to dirt and grime build-up, carpet cleaning likely will resolve this issue. If you are not sure whether your carpet is dirty or worn, call us. We will help clarify and help you set fair expectations for what carpet cleaning can do for your particular carpet. With commercial carpets, it’s often easy to spot wear. Frequently used areas under desks or conference tables are usually the first areas to wear out. At the same time, traffic lanes wear out faster than the surrounding areas. This presents itself as wrinkles, visibly thin areas, tears, opened seams or delamination from the backing of the carpet. If you are unclear about whether commercial carpet cleaning will solve your problem, get in touch. We’d be happy to provide a free estimate for cleaning your commercial carpets. Our office carpet cleaning services are some of the best around. What is the Age of Your Carpet? Another major factor to consider is the age of your carpet. Is your carpet less than 10 years old? If so, you will probably benefit from scheduling a professional carpet cleaning cleaning service. If your carpet was installed back in the 1970s, it’s probably time to upgrade. While professional cleaning can help bring any carpet back to life, it can only do so much. If you have truly old carpet, cleaning it may improve the appearance, but it likely won’t provide the result you’re seeking. If you purchased a home or business and you’re uncertain of the age of the carpet, don’t assume it needs to be replaced. A lot of modern carpet is extremely resilient. Even if it appears to be worn down, discolored, or drab, a good deep cleaning could actually revitalize it. Before you give up on older carpeting, consider scheduling a professional carpet cleaning. What Is the Quality of the Carpet? Another major factor when considering carpet cleaning vs. new carpet is the quality of the carpet that was installed. Carpet has a useful life. High quality carpets can last for 15-20 years, sometimes longer. Wool carpets can look great for many years, for example. We’ve cleaned durable old Olefin carpets that are 20-25 years old that clean up surprisingly well for their age. If you buy cheap polyester carpet, you shouldn’t expect much more than a 10 year useful life from that carpet. A quality carpet, however, can look great for many years. A lot has changed in the carpet mills over the years. New carpet is designed to be more resilient. New technology is built into each carpet fiber to help resist stains and to hold up longer. Factory applied protectants are also commonplace whereas they didn’t used to be. These changes help new carpet look better, longer. Will It Be Suffering A Lot More Wear Soon? Do you have dogs? Are in the middle of house training a puppy? Maybe you have a few small children? Perhaps you have an office where 100 people walk over the same spot each day? These are all factors that lead to accelerated carpet wear. Often, a professional carpet cleaning service is enough to refresh your carpets. Then you can put off replacing the carpets until a later date. We provide a whole suite of pet related carpet cleaning services such as carpet cleaning for pet odor as well. If you are interested in scheduling a professional carpet cleaning service for your home or business, get in touch. 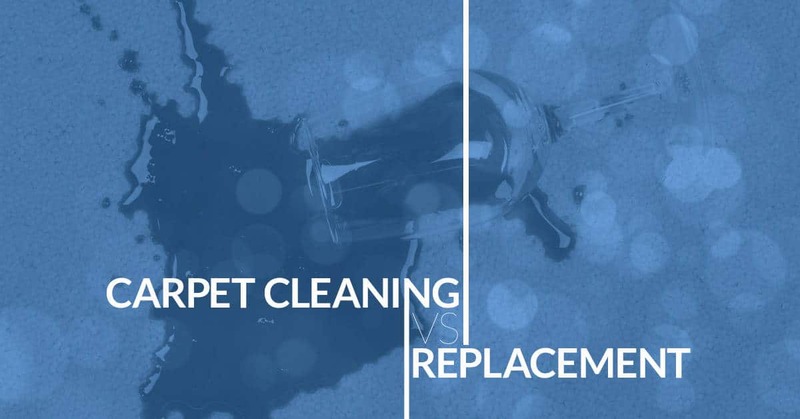 We can help you weigh the pros and cons of replacement versus cleaning. We want to help you determine which option is the best choice for you right now.